Athens: The birthplace of Civilization with the most glorious history in the world. A city when democracy was born. The first city to have held the Olympic Games. An amazing night life, archeological site, museums and temples to see. Arrive in Athens. On arrival our representative will assist you to your hotel. Day at Leisure. Overnight at your hotel in Athens . 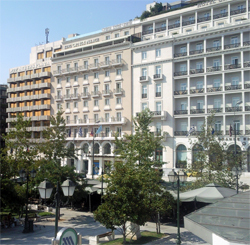 Constitution Square: Also known as the Syntagma Square. It is the most important and a centre point to the city of Athens. The name Syntogma means constitution. The square has a long history of major events which have either been celebrated or mourned here. It played a strong political hold in the 1940's. House of Parliament: To the north of the Syntagma square you will find the house of the parliament. The Construction of this building took approximately 7 years and was designed by the German Architect Friedrich Von Gartner. Originally it was the Royal palace for the Greek kings. Later after a fire it was restored and turned into a museum and hospital. It was only in the 1920's that the government turned it into the Parliament house. Memorial for the Unknown Soldiers: Ethnic costume dressed guards do a shift change ceremony in the memory of the unknown soldiers who had lost their lives. 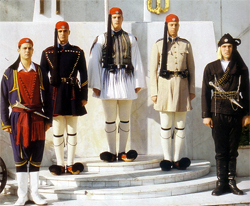 The Guards in these uniforms are called 'EVZONES' meaning well belted. National Library: Earlier known as the "Public Library". It is situated in the centre of the city. A Danish architect named Theophil Freihere Von Hansen designed it. He was known for his Trilogy of New � classical buildings and his technology was also used for the National Library. Panathenaic Stadium: It was Earlier a small natural valley between 2 hills and later transformed into a stadium in 329 � 320 BC. 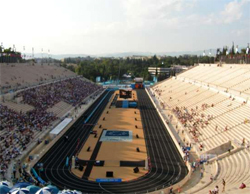 It was used to hold athletic competition on "Panathinea", which was the greatest festival in the ancient Athens. The first ever Olympic games were held here in the 1896. Temple of the Olympian Zeus: A temple, which till today stands incomplete. Originally started in the 6th century by Peisistratos. It has some beautiful columns which have some intricate carvings and the view from here is also very eye catching. Also a must see here is the arch of Hadrian which is also a gate between the ancient and the roman city of Athens. Acropolis Museum: It is located in the east of the Parthenon on the sacred rock. It has some of the most important ancient Greek sculptures. It is also considered as one of the most important museums in the world. It is about 25,000 square meters and an exhibition space of about 14,000 square meters. The Propylaea: Meaning the Foregate. The Propylaea is a monumental entrance to the Acropolis in Athens. It was built between 437 and 432 BC. 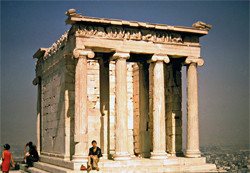 The Temple of Athena Nike: The first temple on the Acropolis to be built in the Ionic style. The temple was dedicated to the Athena for bringing Victory (Nike). The Temple of Erechtheion: An intricate temple, which was designed to accommodate the radically uneven ground on the site and spot where Poseidon hit the Acropolis with his trident. 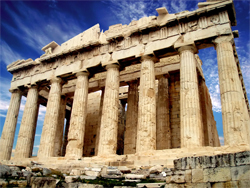 The Temple of Parthenon: A Tribute to the Goddess Athena which was constructed between 447 and 438 BC. It was one of the most important Greek temples until the reentrants attacked Athens and destroyed most of the structure. After your full day tour, return to your hotel. Overnight at your hotel in Athens. 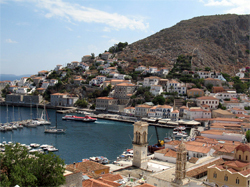 Hydra Island: An island that does not have any automobile transportation. The only automobile on the island are the garbage trucks. The local transportation are donkeys, boats and bicycles. You can wither take a leisure stroll or a swim in the deep, clear and cool sea. There are also many places to go and view here like the mansions, museums, galleries and churches. Poros Island: A beautiful island with Pine, Olives and Lemon trees all over which creat an impressive view. There are also some archeological sites to look around here. 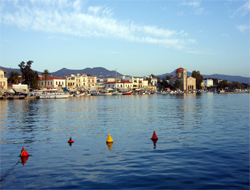 Aegina Island: The second biggest Island in Argosaronikos. The weather here is always good with bright sunshine, warm and clear blue sea. It also has some great archeological sites to see. Enjoy a fun filled evening here. You can also go and visit the Temple of Afea Athena. Temple of Afea Athena: A well preserved temple of the Doric style. It is built with 22 lime stone columns. The temple is dedicated to Aphaia a local divinity. Thebes: Located on the northwest of Athens. It is one of the chief cities and powers of the ancient Greece. The modern city today consist of archeological museums which carry remains from the bronze age and scattered ancient remains. 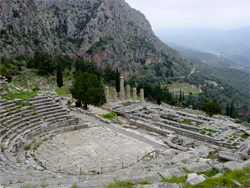 Delphi: one of the most important archeological sites of Greece. It is regarded as the centre of the world as according to mythology the eagles sent by Zeus from the ends of the universe to find the navel met here. Some of the most beautiful landscapes, cultural and religious centre of the world are here. Lunch will be at Delphi. Later return to Athens. Rest of the day at leisure. Overnight at your hotel in Athens. Our representative will assist you to the airport for your journey back home. 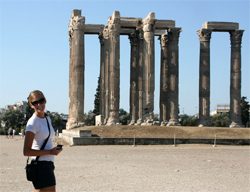 Platinumholidays.com specializes in cheap Greece Tours and affordable Greece Holidays. We offer packages with tours to Athens, to The Temple of Parthenon, cruise tour to the Saronic Islands, tours to Thebes and Delphi. We have great deals to Greece. Any type of tours to Greece we have it. All our tours can be customized to meet your needs and they have connecting flights available from major cities in Canada. Plus our tours have Private Expert Guides and air conditioned vehicles.